Sam Fisher was born in Nottingham, England, where at the age of five he announced to his mother that he wanted to be a writer. Unfortunately he couldn't write at that time (at least not joined up writing) so he spent the next ten years reading comics, playing marbles and tormenting his sister. Soon after leaving school he realized he still couldn't write so he turned his attention to the more immediate gratifications of the film industry. He moved to London in the late 80s to study at the London Film School. He graduated in '86 and moved to Montreal (actually in hot pursuit of a totally gorgeous Canadian girl) where he dabbled in writing children's television, but eventually drifted into far more lucrative film related jobs, mostly as a scenic carpenter. Those were good years and Sam worked on dozens of forgettable B movies earning an honest wage and meeting all kinds of cool people. He also managed to produce three spectacular children with the help of the gorgeous Canadian girl parenthetically referred to earlier. Sadly the creative urge eventually got the better of Sam's rational brain and he was driven to ditch the glamorous life of a B movie carpenter to pursue a career more conducive to writing. In 2002 he snagged a university job at NSCAD University in Halifax, Nova Scotia where he is now tenured faculty in the Film Department teaching screenwriting and film production. In recent years Sam has written screenplays, produced several short films, won numerous international awards and has even written a couple of stage plays. 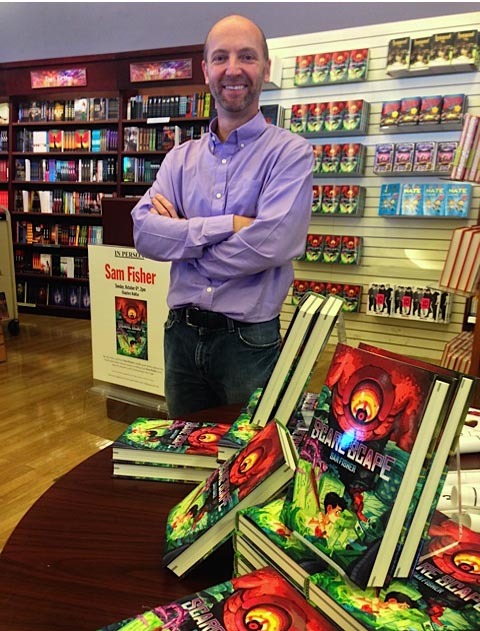 Sam Fisher is busily working away on his next book and might not have time to respond to all of your emails, but you can contact him here to let him know what you think of the book, if you'd like to read a sequel, what were your favorite, or least favorite bits, etc. etc. Sam would love to hear from you, no matter what you have to say.